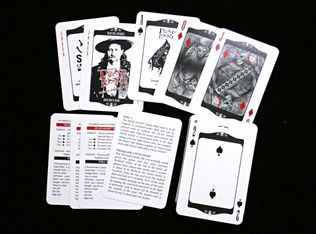 This Card Game includes: 52 standard playing cards, 2 Jokers, 3 Rules cards including variants, and 3 DEAD HAND reference cards. Q: When is a winning poker hand NOT a winning poker hand? A: When it's the DEAD HAND. "The dead hand rules add an additional element of suspense to the game that many new poker players seem to love." Various card combinations are eliminated at the showdown, e.g. all pairs, or all 3-of-a-kinds." An Unholy Union of Poker and Russian Roulette. This otherwise standard Poker deck hides a maddening twist; an almost imperceptible presence within the card face veneer – the hand of death. A deathly presence that may well kill one of the hands at the table. Point is... after all the bets are down, after all hands are revealed, a final card is drawn from the deck. Maybe all remains as it was. Maybe the pair of Aces is dead. Perhaps the low club is the kiss of death. So give a moment's pause before folding. Your opponent’s hand may not be long for this world. Or then again, maybe you hold the DEAD HAND. 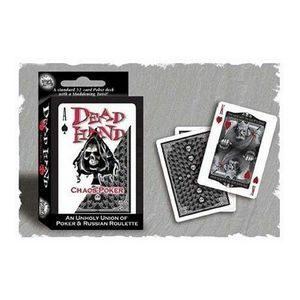 Even with its unique twist, DEAD HAND is primarily a straight-forward game of Poker. The DEAD HAND mechanic ends up only affecting approximately 20% of the hands played. So the mechanic is not a crutch, you've still got to play good Poker. But it is a nasty silver bullet at the end. That said, you may find that the added element of chance keeps people in the game longer and folding a bit less than they might otherwise. Good Poker players will keep the DEAD HAND reference card handy as they carefully watch the cards played. If they are betting on a High Pair, having seen two Queens and one of the Jacks come up lessens the chance of their Pair being killed by the DEAD HAND. And of course, we’ve tipped our hat to Wild Bill Hickock, as well – so there is a new high hand to go for, he infamous Dead Man’s Hand. 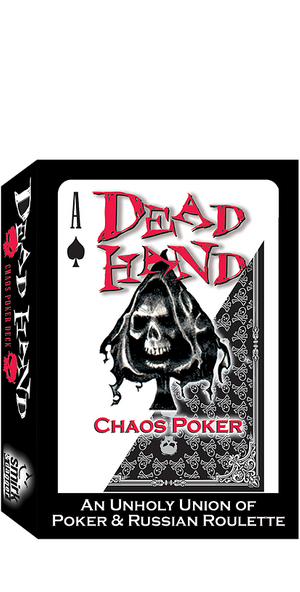 DEAD HAND Chaos Poker is the perfect way to enhance a casual home Poker game – especially if you like some of the fun Poker variants.